Pecans gathered on this morning’s walk with no effort. One thing about Blue Bell Country: It’s also Pecan Country. A Norther blew through last night, and this morning when we walked the dog our neighborhood’s streets were so littered with pecans I filled the pockets of my Barbour. I could have loaded up a bucket or two. Is that why a half-dozen squirrels scampered across our yard this morning like they were on speed? One of the neighbors has been out almost every morning collecting them (pecans, not squirrels, although he’s capable of that); the feed store and a few other places have had “We buy pecans” signs posted for weeks. 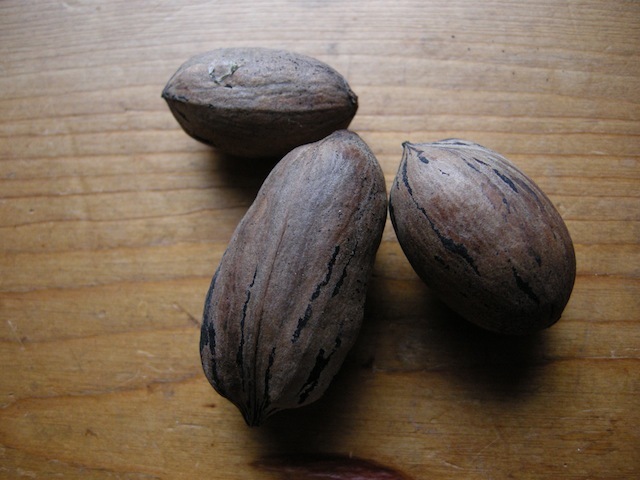 Three kinds of pecans: Small natives, top, a large Mahan, center and something else – perhaps a Witchita or a Cheyenne? There appear to be at least three varieties of pecans growing here. The big old tree in our back yard is most likely a native; its nuts are compact but mighty flavorful. A block or so away, one neighbor may have a type called the Mahan; it’s large and elongated. Somewhere in between are many other cultivated varieties. Many cultivated varieties were bred from a “mother tree” up in San Saba, Texas that is more than a hundred years old and looked pretty bedraggled when I ventured to see it a decade or so ago for a story that appeared in Saveur. After that adventure and plenty of taste-testing, I cooked with nothing but Wichitas for years, because they have abundant oil that gives them an extra rich flavor in baked goods. I’m less picky these days. And it looks like some baking is in order, if only I can unearth the nutcracker from the pile of boxes in storage. 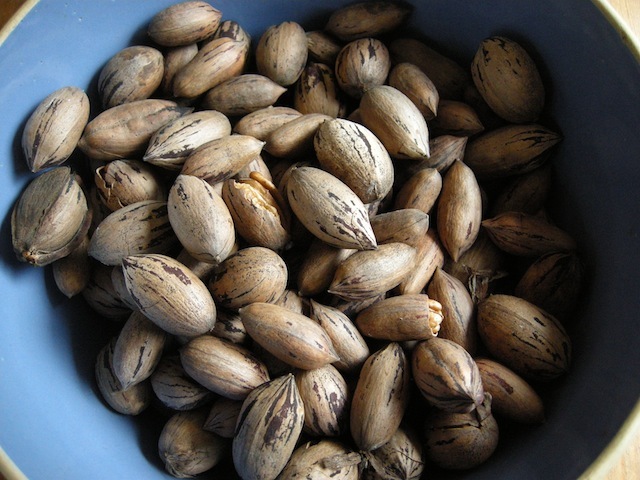 This entry was posted in DIscover Brenham and tagged Pecans on November 27, 2012 by Molly Glentzer.